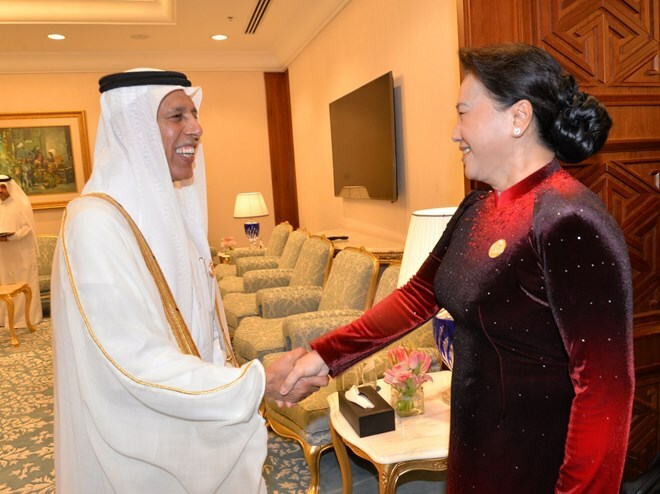 Doha (VNA) – National Assembly Chairwoman Nguyen Thi Kim Ngan met with Speaker of the Advisory (Shura) Council of the State of Qatar Ahmed bin Abdullah bin Zaid al-Mahmoud on April 8 on the sidelines of the ongoing 140th Assembly of the Inter-Parliamentary Union (IPU) in Doha. Congratulating Qatar on hosting the Assembly, Ngan expressed her belief that the Qatari Council will successfully organize the event, contributing to improving the country’s role at the world’s largest multi-lateral parliamentary organisation. She stressed that the relationship between Vietnam and Qatar is developing well in all fields, pointing out to direct air routes connecting Doha with Hanoi, Da Nang city and Ho Chi Minh City – the three largest cities in the three regions of Vietnam. Vietnam treasures its ties with Qatar, Ngan affirmed, suggesting both sides maintain cooperation in various fields and intensify trade in the fields they have strength. The host congratulated Vietnam on its socio-economic development and international integration achievements. He affirmed Qatar’s willingness to support Vietnam if the latter has demand.